Explaining how she happened to come across the country from Seattle to Vassar in 1930, McCarthy said it was because of a very good teacher and Vassar graduate named Dorothy Atkinson at the Annie Wright school, a woman of "satirical wit and style" who urged her to set her sights on Vassar. In those pre-college years at the suggestion of Atkinson, McCarthy began sending essays to H.L. Mencken at the Mercury, where he was editor, and although she didn't get any reaction from him about her writing, the experience got her going. When McCarthy came to Vassar as a freshman "there were all sorts of fantastic things that" she "thought [she was] going to do--such as to study Persian" and philosophy. But it turned out that she found the philosophy department to be less than stimulating. She mentioned three teachers who fell in that category and was willing to mention a few more, but at this point I was a little nervous about the course the interview was taking, feeling a bit protective of the college and that I must try to elicit some more positive response. (She sensed that immediately in my questioning, saying "You don't want me to dwell on the negative?") I knew where there would be a positive response, because I followed Mary into the English classes of Anna Kitchel, who had been in due course mentor to both of us, and Anna Kitchel thought not only that McCarthy had the bluest eyes she had ever seen, but that her writing as a freshman was the most dazzling undergraduate writing she had encountered in her career. "Oh, Kitchel, right away, right away, English 105. She was really a top-notch teacher. Very, very fine. She was a marvelous human being, a rich-hearted woman, and she had that love of life, and humor and tolerance also. She was very good at getting things out of our inhibited little girls in the freshman themes that we wrote for her. We had complete freedom as to what we would write about; we didn't have to cast it into any form, and that was excellent, very good for our writing. It was the last writing course--it wasn't a writing course, but it was the last course that elicited writing that wasn't term papers that I ever got anything out of. The best thing that I ever got out of Vassar was Kitchel in 105. If the whole thing could have been like that..."
Later on in the interview she spoke of another important professor, Helen Sandison, a Renaissance scholar. "I adored Miss Sandison. In a way she almost replaced Anna Kitchel in my heart; I liked them both tremendously, and there was no rivalry between them for students' hearts, they weren't that way at all, thank God. There were lots that were always trying to break girls up with their mother--very wicked old--anyway, so Miss Sandison, I had her for Shakespeare, in English 165, that must have been sophomore year--it was. She was the one...that insisted on the girls not using bowdlerized versions; and if she saw a bowdlerized version it was like, you know, a pack of cards in a Baptist home... Our background reading was always the most interesting, and her choice was the most refined and I remember one oral report or theme or whatever we called them then that I should have written up but let it go--too long-- and I finally said, 'I am really going to do this next week' and she said, not impatiently but rather disdainfully, 'Oh that's deadwood by now.' So, I had to do something else. That was a rather good way of punishing me for not having my paper in on time--better than the conventional ways of marking your paper down or whatever." "I remember discussing King Lear in terms of Woodrow Wilson, and I think it was the class that brought that out, and we then kicked that idea around in rather a Vassar way, and I was much taken by that sort of thing too. ...If there was any single course at Vassar that I would say was formative for me, I would say it was that one. It has really stayed with me ever since and such ethic as I have is really Shakespeare's ethic that I learned in English 165." She spoke of a visit to Sarah Cleghorn the poet, who lived in Poughkeepsie. (Cleghorn wrote the verse: "The golflinks lie so near the mill / That almost every day / The laboring children can look out / And see the men at play," which bold four lines were published in FPA's column in the New York Tribune in the '30s. Daniels: Was she on the faculty? Daniels: I hadn't realized she taught at Vassar. McCarthy: Yes, and I think she somehow didn't work out with the department...we had tea, and I think she was rather bewildered by [the] visit, which was a sort of homage visit. Daniels: Who else would you have something to say about? McCarthy: MacCracken. 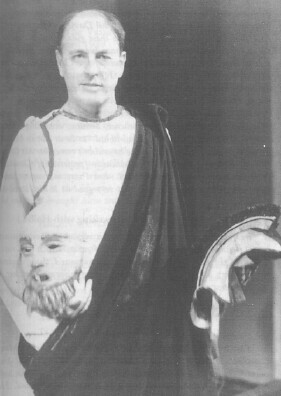 I remember very well [his role as] Theseus in the Hippolytus.... That was very funny. He was good. He was very good. I thought one of the highest moments in the theater." (McCarthy spoke at length about the dazzling production.) "But a funny thing happened in that Prexy [MacCracken] forgot his lines--we didn't know that in the audience because, according to the story--it sounds legendary--he ad-libbed "to be or not to be' (laughing)--in Greek--and just slipped it in where he couldn't remember his lines. No one noticed except old Miss Macurdy with her ear trumpet--she realized what Prexy was up to..."